The CBO (Centralized Business Office) model typically consists of performing the “core” functions of a school district business office. Those “core” functions include accounts payable, payroll, and general ledger accounting. The Questar III CBO model includes those “core” functions; however, we will modify our model based on the needs of our clients. For instance, our model already includes grant management services as well as fixed asset management accounting. As your CBO, it is our goal to assume the day-to-day business office tasks so that your business official can focus on the long-term financial plans of the district. The CBO staff consists of highly-trained professionals with school district experience and expertise in areas including, but not limited to, state aid, insurance, financing, budgeting, and employee benefits. The CBO staff’s extensive knowledge creates a diverse and exceptional team. Our core team members always make themselves available to assist the members of your district office. 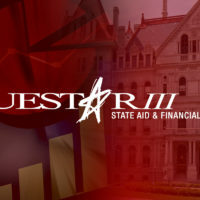 The Questar III CBO team is committed to ensuring that your district business office operations continue effectively without interruption. We focus on delivering services that are performed efficiently and effectively and on a timely basis. We realize that you have deadlines, and we want to ensure that you continue to meet them. A major advantage of a CBO is the personnel and knowledge capacity that it provides. While our CBO operates on a Finance Manager platform, members of our CBO team are also familiar with WinCap. A district may receive a percentage of the cost of the service back in BOCES aid. Aidable percentages vary by service and school district. Our CBO services are offered on an a la carte basis because we realize that the needs of the districts and of the school district business officials vary. Costs are established based on the service(s) requested, the size of the district, and the needs of the district.